Just like the country itself, Malaysian street food is exciting, eclectic and bursting with myriad flavors. 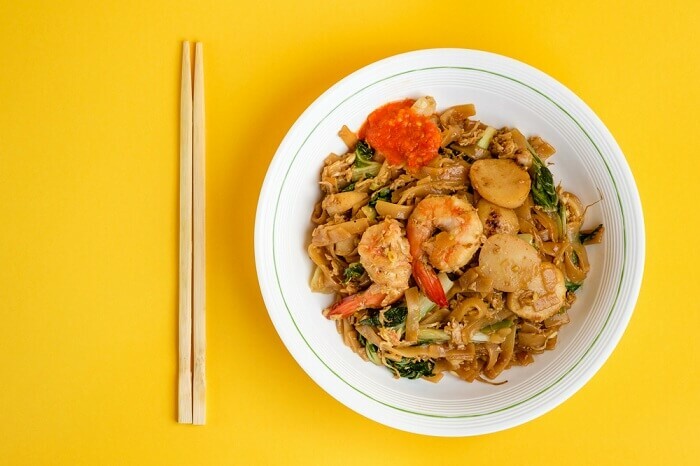 With its Chinese, Thai and Indian influences, the best Malaysian food will blow your mind with a range of dishes that use interesting and exotic ingredients to create a palate-satiating fare. 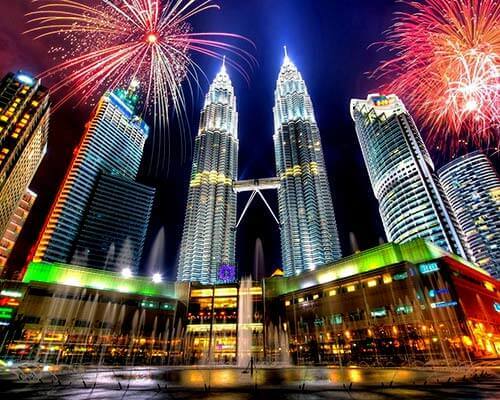 Do try all these delicious dishes on your next trip to Malaysia. 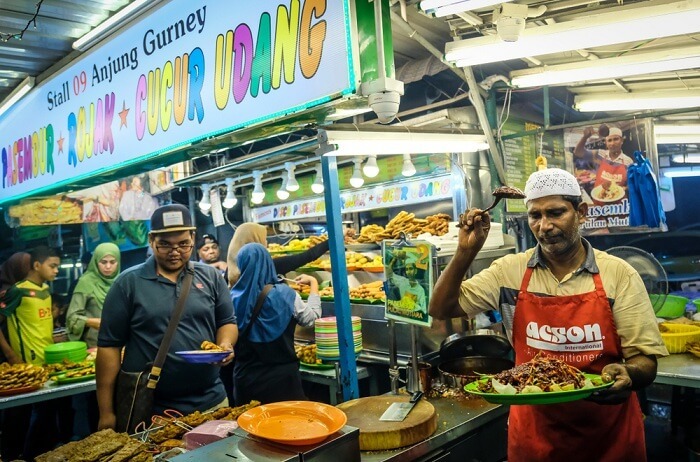 Malaysian street food recipes vary in different parts of the country. 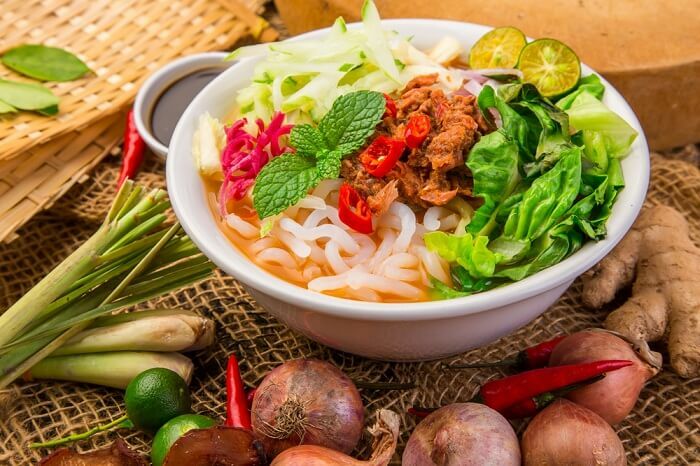 In Penang the humble noodle soup dish (laksa) is transformed into a tangy and delightful concoction by adding Assam (tamarind) and many more flavourful herbs, making it one of the most popular Malaysian street foods. Flat thick rice noodles and mackerel shavings give the broth its flavor while lemongrass, ginger flower, and Vietnamese mint leaves tantalize your taste buds with every spoonful. Add just a scoop of shrimp paste to this mix and you’re in for a treat! Don’t let the name deceive you into wondering what a salad is doing on the best Malaysian street food list. This quintessentially Malaysian variant is a sweet and sour preparation of assorted fruits and vegetables in shrimp sauce garnished with crushed peanuts. 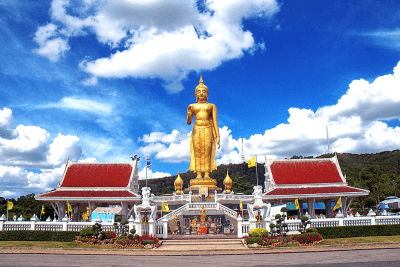 It typically uses turnips, cucumber, green mangoes, bean sprouts, fried tofu, and green apples. The Penang style rojak uses guava and honey too; the final dressing of sugar, chili, lime juice, and shrimp paste suffuses the dish with its unique flavor. 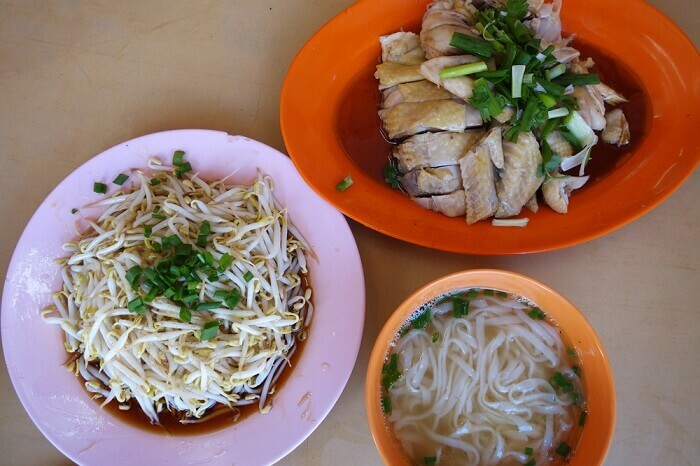 These unique flat rice noodles found nowhere else in the world have not just a delightful taste but also an interesting story to tell. 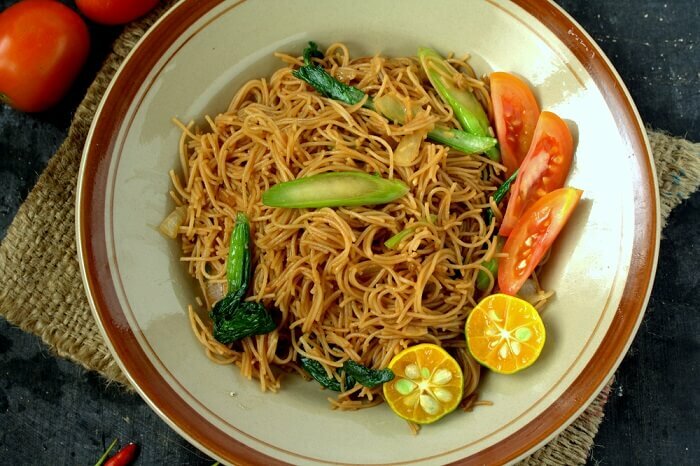 Brought to Malaysia by the Chinese immigrants at Ipoh (in Perak State), these noodles are said to get their unmatched flavour by using the special spring water from limestone hills around Ipoh. The rice noodles are served in a rich chicken and prawns broth with shredded chicken, prawns, mushrooms, spring onions, fish balls, et al. Also called Kai See Hor Fun, they are sometimes served with hot chillies in soy sauce. Where: Thean Chun’s stall in Old Town, Ipoh. 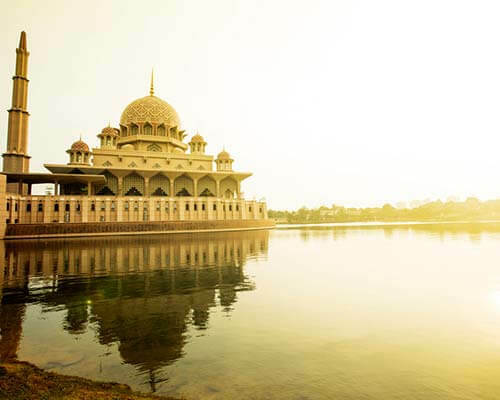 Suggested Read: 11 Honeymoon Destinations In Malaysia: Each To Their Own! Brought to Malaysia by the Hokkien immigrants from China, this is another Malaysian food offering a flavor overload with its range of ingredients. Yellow egg noodles cooked in a dark soy sauce are then topped with pork meat, squid, prawns, and pork lard. A little sambal balacan gives it a nice spicy hint. The Penang variant is cooked in shrimp stock and garnished with fish cake, spring onions, and lime to give it a distinct flavor, while keeping the basic dish same. Literally meaning “dip dip” this is one ubiquitous Malaysian street food that offers a variety of tastes in a single satiating meal. 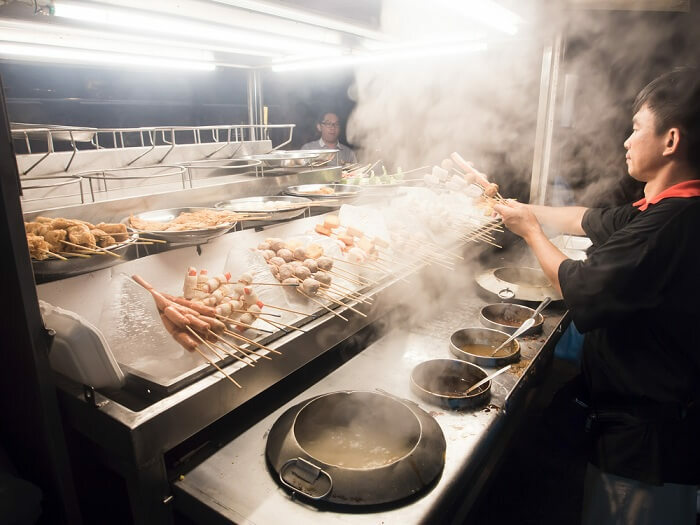 The idea is to choose from a range of Malaysian food skewers with varying prices, and dip them in a steaming hot delicious broth. 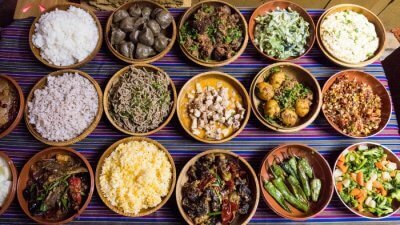 This fun way of community eating around a single clay hotpot is now hugely popular through food trucks around the cities. The semi-cooked skewers include meatballs, prawn, cockles, etc which are dipped in either hot peanut sauce or boiling soup stock. Though Nasi Lemak is known the world over and available at most restaurants and cafes, nothing beats the fresh banana leaf packages sold on the streets. 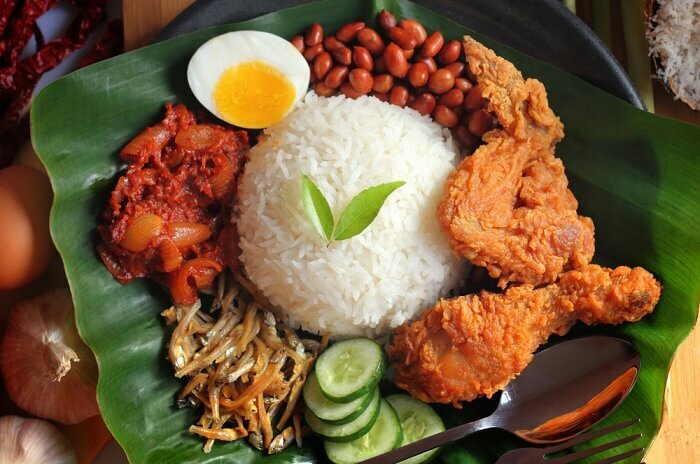 This popular Malaysian food is primarily a delicious and sumptuous rice breakfast dish. The delicious coconut cooked rice is perfectly served with boiled egg, cucumbers and fried anchovies in shrimp paste and chili sauce. This fragrant rice dish is apparently considered as the national dish of Malaysia. 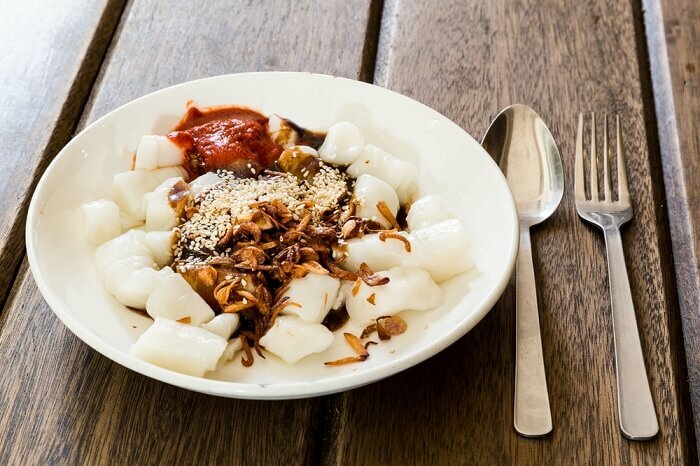 Chee Cheong Fun is originally a Cantonese dish belonging to southern China and Hong Kong, yet it is popular in Malaysia. 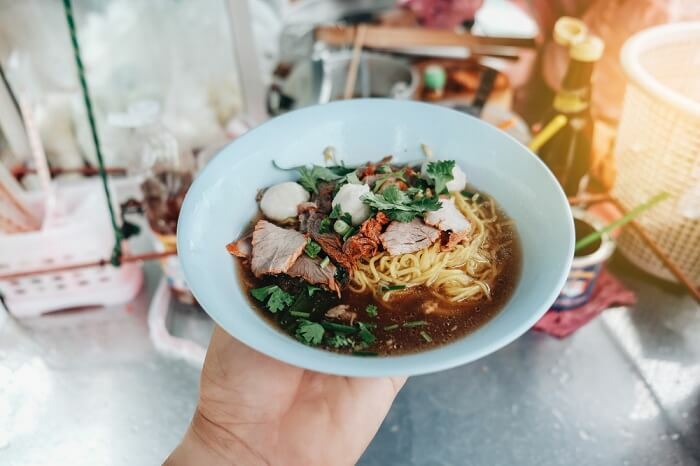 Perfect as a hearty breakfast or a satiating mi-day Malaysian snack, this rice noodle dish is a must-feature on every Malaysian street-food list for its simple yet flavourful offering. Though similar too yet distinct from the rice-noodle rolls sold at dimsum stalls, this one uses thick rice noodles in a dark sweet shrimp sauce with some chilli sauce. Where: A small stall outside of Seow Fong Lye Cafe, 94C, Macalister Lane, 10400 Penang. This creamy and flavourful Malaysian dessert is a must-try for those with a sweet tooth and an appetite for unusual and interesting dishes. 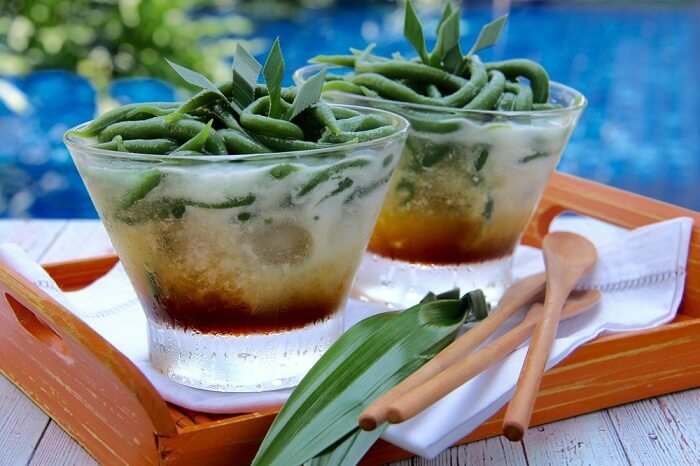 Prepared with coconut milk, palm sugar syrup, and ice shavings, Chendol is usually served in a tall glass or a bowl. The green jelly-like noodles made from mung-bean flour and food coloring (from the pendan leaf, a vanilla like plant) give the dish its unique taste and drool-worthy appearance. Many vendors also garnish it with diced jackfruit and sweetened red beans called ‘durian’ before serving you this delightful Malaysian street food in Kuala Lumpur. Where: Penang Road Famous Teochew Chendul. 27 & 29, Lebuh Keng Kwee, George Town, Penang. One of the most flavourful noodle preparations among the best Malayasian food, this smoky version is a must try when visiting the country. Flat rice noodles cooked in a traditional Chinese wok at high flame, turn to this aromatic delight with a distinct smoky flavour. Soy sauce, prawns, bean sprouts, spring onions and sausages lend their flavours and taste to make it the king of Malay noodle dishes. The noodles are usually cooked in small batches to retain the smoky aroma. Certain special versions are peppered with mantis prawns and crabs. No Malaysian street food market is complete without the huge open ovens loaded with meat skewers being char-grilled to perfection. Marinated pork, chicken and beef pieces on bamboo skewers are served smoky hot with peanut sauce, cucumber chunks and raw onions. 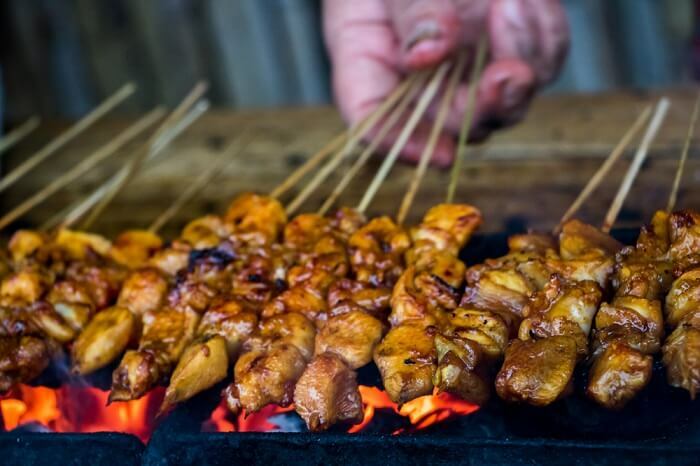 The sight of enthusiastic satay vendors fanning their ovens to serve you these perfectly grilled yummy chunks is enough to set your stomach rumbling! 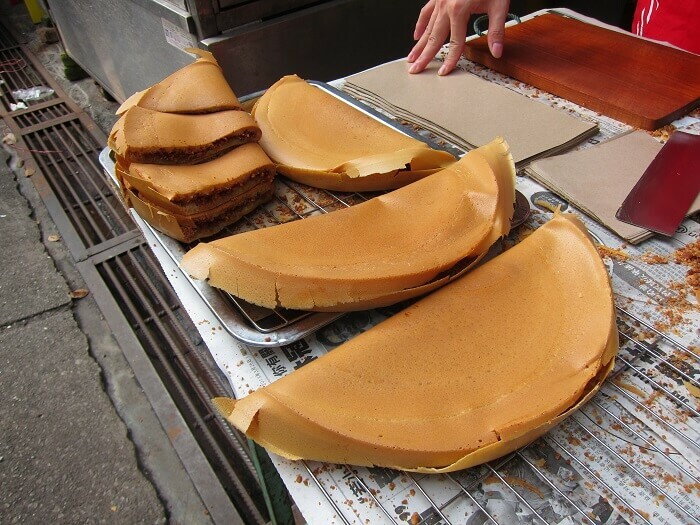 Apom Balik is an unusual panckae that you will only find in the streets of Malaysia. The panckae is made from sticky rice with a creamy corn side. 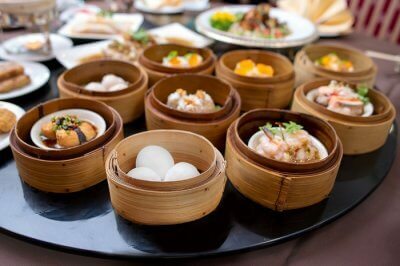 It is very common street food in South East Asia. It is sweet, eggy,and fluffy. You will aslo find a peanut filling inside the panckae that offers a crunchy and peanut-ty taste to the pancake. The giant size panckae should be on your list of Malaysia street food to try when you visit this country next. This is a simple yet delicious Malaysian breakfast which one must definitely try on their vacation to the country. Quite common with the locals there, it is an easily available and loved Malaysian street food. If you are at the Sentosa resort, then it is even easier to get yourself a plate of Fried Bee Hoon at the Malaysian food street in Sentosa. The dish is basically rice vermicelli topped with sausages, fried eggs, and whatever one wants to eat. 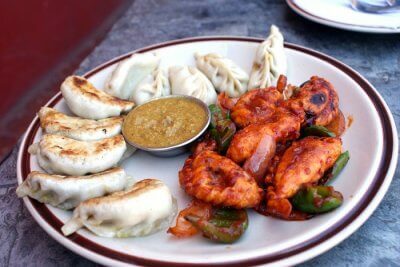 Though the Malaysian street food list can go on and on endlessly with its overwhelming variety and flavours, there are two Indian origin dishes that deserve a special mention for their popularity and taste. The Canak Roti which is a flaky flatbread goes well with the Teh Tarik (literally, ‘pulled tea’) the famous tea that’s poured interchangeably between two containers to give it its froth and add that dash of style before serving! 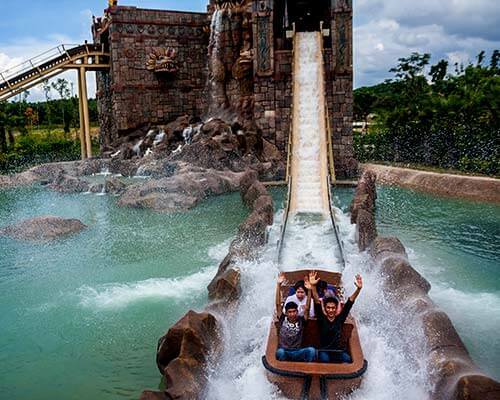 So don’t forget to try them as well on your Malaysian holiday. Q. What is the most popular food in Malaysia? 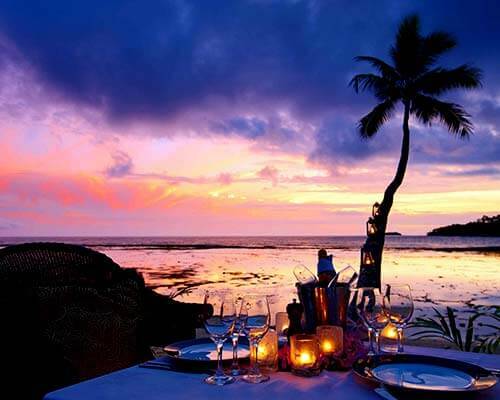 A. Nasi Lemak, Banana Leaf Rice, Hokkien Char Mee, Rojak, and Satay are some of the popular Malaysian food. Q. How much does Malaysian street food cost? A. Kuala Lumpur can be a bot expensive in terms of food. You would be spending around INR 250 bucks for breakfast and INR 500 for lunch and dinner individually. Q. 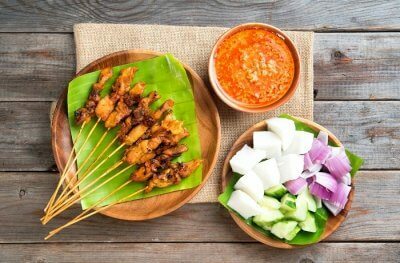 What is Malaysian hawker food? A. Malaysian Hawker is a kind of street food prepared by the hawkers on the road side. 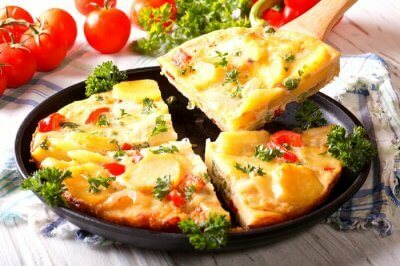 When you are visitng Malaysia, you won’t find delcious Malaysian food in the restaurants. Rather it is these street food markets and hawkers that serve the most lip-smacking cuisine. 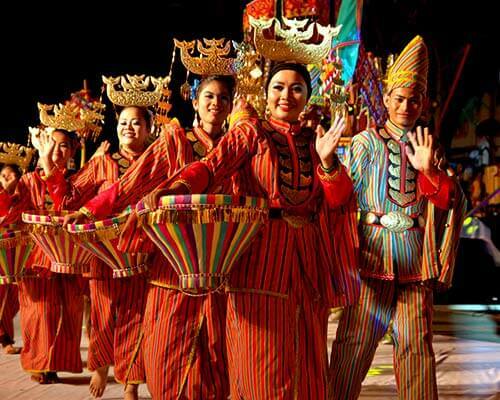 Malaysian Cuisine: 10 Delicacies Which Will Let You Taste The Authentic Flavors Of Malaysia!